My boyfriend and I live in Montana. It was important to us to find a reputable breeder that we could trust. I found Brett’s Painted Boston's after quite some time of research. I flew to Indianapolis to pick him up, and Sherri drove all the way to the airport and even met me inside to give me our boy. Her knowledge and patience is unprecedented. She answered every question I’ve had, before and after receiving him, with kindness and care. I would highly recommend BPB to anyone looking for a Boston Terrier, no matter the distance. We’ve got a healthy, happy, smart and loving boy. Sherri Brett came highly recommended to us from some good friends who received their Boston Terrier from her a couple of years ago. It was important to us when selecting a breeder that we work with someone who is passionate about the dogs and the breed, and cares very much about the babies and the homes they go to. Sherri took the time to get to know us before giving us our girl (Penny) and we appreciated all of her checks and balances along the way. Our Penny will be three months old this week, and she is such a beautiful and intelligent little lady. We love her so much! Sherri has set the standard for us of what a highly esteemed and reputable breeder should be. We are so happy to have Penny as part of our family, thank you Sherri and the Brett’s Painted Bostons family! I cannot say enough about the wonderful experience it has been working with Sherri Brett and Brett’s Painted Boston’s. It was extremely important for me to find and work with a reputable breeder who raised healthy and happy pups. After years of extensive research, I settled on Brett’s Painted Boston’s. Sherri Brett is a patient, knowledgeable breeder who communicates clearly and effectively with buyers during and after these pups have left her care. The love she shows for these babies is unprecedented. The wait can be lengthy as these gorgeous creatures are in high demand, but if you’re a serious buyer who has done their homework you know the wait is well worth it. The overall process from application to in person pickup is smooth and Sherri’s website has more than enough information to ensure buyers are well prepared. While Lexi now loves NYC and calls this her home, her heart will always be in Indiana with her first mom, Sherri Brett! Thank you, Sherri and Brett’s Painted Boston’s for raising such wonderful puppies. I am so in love with my new baby girl. She’s sassy, crazy smart and beautiful. We will most definitely stay in touch as we learn and grow! Luna is doing great, our training has really started to pay off. She can sit, lay down, crawl, calm, leave it, and fetch with good reliability. We are still working on stay.she is quite a beauty. She also has an absolutely wonderful temperament, both a credit to you and your program. We are so grateful that you chose to share her with us. Buying a puppy from Sherri is a 5 star experience. 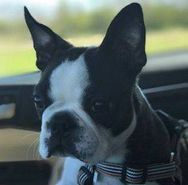 Her website is filled with informative, useful, and interesting information about Boston terriers and dogs in general. We adopted our little male puppy at 8 weeks of age. He is a beautiful, healthy, well socialized little guy who has a great temperament and is full of energy. He is very smart and so eager to learn. He gets along fine with our other dog and is a joy to have in our family. Sherri is very professional, answered all our questions, sent photos and video updates of the puppy's development and is a pleasure to do business with. She even gave us a puppy gift bag filled with goodies for our new baby. She is very careful about screening her potential buyers so that her puppies get good, forever homes. I would highly recommend buying a puppy from Sherri to have many years of love and joy with your " best friend." Molly Mae and Kacy Kay are the center of our family life, and we can't image it any other way. Kacy has stolen Kenny's heart and I am so glad! Molly loves to play and catch toys in the air,Kacy chases Molly or sits on a lap to watch Molly. Kacy is kind of a lap dog and I love it, she can't get close enough to me at night, can you tell I love my Painted Girls? Stella is pure Joy! Her personality is perfect. She is the 1st Boston I have had that likes to DIG so much. She digs in the couch, she cries to get in the Garden with me to Dig in the Dirt!!! Don't remember our other Boston to be so obsessed with Digging! Very cute when she is not up to her elbows in mud. When she is she gets popped in the shower! or in her baby pool. I will have to send you a video of her scooping up water with her mouth. Like a pelican. HA HA Can't wait to take her to the Lake to see her swim. She will be a natural with those big Apollo feet. She is a Social Butterfly too. I take care of Friends dogs and she loves playing with them!!! Love her to the Moon & Back! Thank you so much. I have recommended you to several people looking for Bostons. I told them there is a waiting list and approval process. P.S. Bought her one of those "Loving Bowls" for Brac dogs. She really likes it! We drove over 2200 miles round-trip from Portsmouth, NH to Shoals, Indiana to pick up our beautiful new Boston Terrier, Suzie. We lost our beloved Boston, Rocky on Labor Day, 2016, early in his 12th year. He had physical problems throughout his life and it took effort. love and resources to get him through a decent life. We did our research and decided to opt for the best breeder in the country, Sherri Brett. We spent a couple of hours on her farm in Indiana and finally had to tear ourselves away from her loving family of Bostons . Suzie is a handful as a puppy, but we have her in puppy training now and she is learning as are we. She is breath-takingly beautiful , healthy, smart and lovable. She weighed 5.7 pounds when we adopted her and is slightly over ten pounds now. She has yet to see an object that doesn't go into her mouth. We are stopped all the time by strangers who are taken by her beautiful face and markings, the hallmark of her championship blood-line. We are delighted with our new "daughter" and will only deal with Sherri for our future Boston Terriers. Thank you, Sherri, for my beautiful little girls, Matani and Gili, (Piper & Nick’s litter, born 9/17/2017). I have had Bostons constantly in my home for 45 years! Every single one has been smart, special, and loved. But not until I discovered Sherri Brett’s Painted Bostons have I encountered a breeder so professional, so loving, so devoted, so approachable and available. Even before I contacted Sherri for the first time, I felt part of the Painted family for over a year just by following the website and Facebook, anticipating every birth and following their progress and adoption. Such beautiful fur-babies, both large and small! My husband and I live in Israel, but I visit my family in my home state of Indiana. And then we thought....is it possible to bring a puppy home after my holiday visit? After researching all the new Israeli import regulations with the assistance of Sherri’s vet, Dr. John Royal, Sherri offered one of Piper’s little girls who would be old enough to travel. And, then there were 2..... if I’m bringing back one, why not two? Matani and her litter sister “Laney” had become inseparable best friends. Instead of keeping her, as she originally planned, Sherri offered her as my second puppy. We couldn’t be more thrilled. They are so beautiful in every way—and still the best of friends. It was wonderful to finally meet you, Sherri, visit the farm, and meet so many beautiful Bostons. Thank you for the updates, pictures and videos so we could watch them grow. Thank you for answering my countless emails. While we welcome our new little Israelis to our home in Jerusalem—we’ll always remember their first home with Sherri—Brett’s Painted Bostons of Shoal, Indiana. 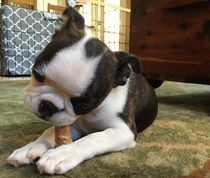 As I sit here holding my Boston Terrier puppy, I am indeed grateful for all the time, energy and love that has gone into making this puppy confident, comfortable and easily adaptable to a new home. Sherri has been conscientious, helpful and well aware of matching puppy with its new family. Her website is a vast array of information to assist new puppy families in understanding details that are often overlooked or neglected. She has always been available and her care and love for her puppies is foremost in all she does. Yes, I would purchase another puppy from her again. Our new puppy, Lucy, is a beautiful ball of joy and energy. When we picked her up at Sherri's farm, we could tell right away how much Sherri loves and cares for her Bostons. Lucy already knew her name and was quite comfortable around people and pets. Lucy is our second Boston. We can really see the positive difference in Painted Boston's quality of care. We highly recommend Sherri Brett's Painted Bostons! I hope all is well. Well it's hard to believe Baxter (Perry) is almost 9 months old! We have been so blessed to have such an amazing little guy come into our lives! Baxter is extremely well-mannered, intelligent, a fast learner, and loves children. This little guy has the run of the house, with several comfy beds everywhere. He especially enjoys stealing my fuzzy throw blankets! You have a knack for raising some amazing Boston Terriers! Thank you again for Baxter! We love him and please know he is extremely well loved and taken care of. We couldn't have asked for a more perfect experience when adopting Cosmo. Sherri kept us informed and updated throughout the entire process as well as sent videos and pictures of our baby. 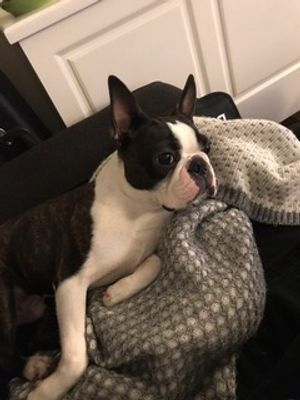 The veterinarian immediately knew that Cosmo came from a great breeder and bloodline and said he was as healthy as a Boston Terrier can be :) Cosmo is the sweetest puppy with a great temperament and he just loves to be loved on. We couldn't have asked for a more perfect puppy or a better breeder. Sherri is dedicated to producing healthy puppies and it shows. We are so happy to be apart of the Painted Family! Fenway was officially ours on July 17th. It was a fun greeting arriving at Brett's Painted Bostons. There was a group of adults and youngsters, who all ran for the fence looking for some attention. Happy, healthy Bostons. Fenway and his friends were in the house. Fenway greeted me with tons of kisses. Fenway is my fourth Boston. The last Boston, PeTe, was a puppy mill guy. I had no idea until we got there. We could not leave him there, so he came home with me. PeTe did not have the wonderful introduction to life that Fenway was blessed to have with Sherri. Fenway and his buddies had adult Bostons, youngster Bostons, baby Bostons, adult people and children to hang out with and learn from. Fenway was showered with love and caring. It is obvious, even at his young age, the care that has been taken. After PeTe, I took care to search out a breeder. Sherri had every single qualification listed for a Boston breeder. From my first contact, she was friendly and helpful. Throughout my wait, she would answer my questions promptly. She never disappointed. I feel that Fenway will grow into a terrific companion. I am more than happy and pleased with my little guy. I know Sherri is a person who will always be there for every single puppy that has been lucky enough to start life at Brett's Painted Boston Terriers. Working with Sherri has been a completely wonderful experience. 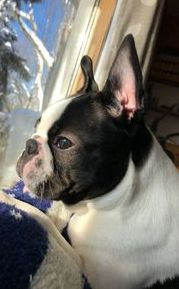 After the loss of our previous Boston we knew that we'd want to share our home with another Boston, and our search for finding a responsible and responsive breeder led us right to Brett's Painted Bostons. Throughout the entire process of our initial inquiry, to our application, and then to being matched with a puppy and bringing her home, Sherri has been incredibly communicative. She answers any questions and provides great support. Additionally, I loved being able to see all of the updates, photos, and videos that she posts to her website and Facebook account. Aside from just being fun to see it gives you a great sense of her Boston family and their personalities. Plus, once we were matched with our sweet little Franny we got pictures and videos sent via email and texts on several occasions until it was time to finally meet her in person. If you have the opportunity and ability, being able to pick up in Shoals is a real treat. Not only is the area around Shoals beautiful, it was wonderful to have the opportunity to meet both Sassy and Rockwell (Franny's mom & dad).By seeing Sherri interact with all of the dogs - both the adults and puppies - it is plain to see just how dedicated Sherri is to her dogs and the work that she is doing. Sherri gave us lots of suggestions to ensure that our 7 hour drive home with Franny was safe and a pleasant experience for all of us. At our initial vet visit our vet noted how healthy she is, and all of the techs in the office came to 'ooo and ahh' over her. Franny is an incredibly sweet puppy with moxie - she knows how cute she is and knows how to work it to her advantage! I can't thank Sherri enough for our little girl and I am so pleased to be a part of the Painted Bostons family! Sherri cares deeply about her dogs, puppies, and the families she adopts to. I am sure that one day I will appear on the deposit list again with '2nd Painted Bostons puppy' noted after my name. First off I don't know how Sherri does it. From the first contact to the actual pick up there was a continual stream of communication. I knew our beloved Stella before I even held her! When we picked her up Sherri took the time to cover everything, she left nothing out, it was very relaxed. If you are looking to adopt a quality Boston look no further. We are truly blessed to have Stella join us and we thank Sherri for that!! Piper is the best dog we could have ever asked for. She's very playful, friendly to everyone- the most sweetest, cuddliest and has such a great personality. Everyone compliments us on how beautiful she is. We are completely in love with her and couldn't be any more happy with our baby Piper! She's spoiled rotten and her ears are standing up beautifully. We will most definitely be coming back to get another one in the next year or so. We want her to have a play mate. Sherri, Thanks so much for your hospitality to us this past weekend when we came to pick up Lexie. She has been so well socialized and nourished at Brett's Painted Boston's. We spent the first night in a French Lick motel and were able to spend some quality time bonding with her. She has made a smooth integration into our home and family here in southern Ohio. We had the opportunity to be welcomed into your home and to see your nursery and the play areas for your dogs as well as being able to see Lexie's Mom and Dad. Thanks again for your dedication. I am also impressed with the achievements of you and your Show dogs. Thanks to Emmy and Buzz for your sweet daughter. I was initially very nervous and unsure about adopting from a breeder over the Internet. It's so hard to tell if someone is genuinely honest from just their website alone. I can honestly say my experience with Sherri at BPB was amazing! Sherri is very professional and honest. I had a never ending list of questions and concerns and Sherri was happy to answer them all. I'm glad I had the chance to visit her home to pick up Phia. Being able to see the parents of my baby and getting to know Sherri in person really reassured me of her high standards for breeding and health. I am very impressed with how perfect Phia fits in with my family. She has an outstanding personality and beautiful brindle coloring. Its very obvious the passion Sherri has for breeding and it shows in her puppies. You can tell she spends a lot of time working with the puppies from birth on. I couldn't have asked for a better experience and plan on adopting another family member from her in the future! Wow! We adopted Jamie about a month ago. What a wonderful pup she is. Everyone comments what a beautiful Boston she is. She's got a great personality too. Maybe a bit on the feisty side now. Yet, that's normal for a pup. We when we arrived at Sherri's, we found Sherri surrounded by Boston puppies. I have never seen so many Bostons in one place. Sherri has a wonderful place, and you can tell she takes her breedings seriously. We had a great time talking to Sherri while we got to know Jamie. If we ever want another Boston Terrier, Sherri is who we will contact. I highly recommend Sherri if you are looking for a beautiful Boston Terrier puppy. Thanks Sherri! 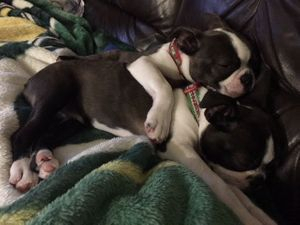 I just read a very disturbing post on Facebook about a Boston Terrier breeder that prompted me to write a review about a wonderful breeder ~ Sherri Brett! Thanks for taking care of Edna for the first 8 weeks of her life. I know that she was well cared for and loved. Sherri was prompt to answer all of our questions and involved us in Edna's life through weekly pictures. I was in love with our puppy before I even met her! 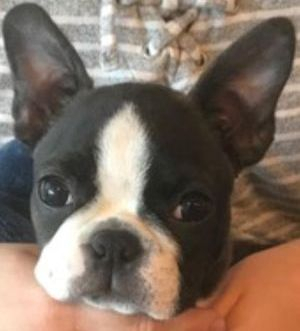 Thank you Sherri for being a reputable breeder that cares about the Boston Terrier breed and a caring breeder that wants to stay connected with each puppy via Facebook. We were so sad to lose our last Boston "Willie" in May 2014 but decided we could not live without a Boston so our search began. We knew what we wanted and pleased beyond description to have discovered Brett's Painted Bostons! This is our 4th Boston and were aware of some of the congenital problems they could have. Sherri has extremely high standards and requirements for her breedings. Her knowledge of this breed is fantastic and she is dedicated about caring for each of her babies until they are ready for their adoptive parents. We were tickled to receive descriptive summaries of their height and weight as the morphed from newborns to 7.5 week pups! Just wait until the videos start coming! We couldn't be more pleased! We traveled 978 miles to pick up "Cato" and we would do it again. We are so happy to have him in our family! He has truly melted our hearts....Thank you Sherri! "All my life I have spent with dogs in the household, but since moving to New York with my husband in 2014 we haven’t had a dog, as my Brittany spaniel had just died a few weeks before. My husband realized I could not be truly happy without a dog in my life! Thats when the search started for or a breed that best suited our lifestyle and the small apartment space in Manhattan. Known for their intelligent and affectionate personality, Boston terriers seemed like the perfect match for us. When he shared his thoughts with me, I was very exited but also a little nervous as this was the first time we were looking for a puppy through a breeder. We did a very thorough online search on the breed and the breeders and we ran into Sherri’s website which we really loved, with all the pictures of her family, her dogs and all the animals at the farm. Indeed she is very lucky to live in such a beautiful area. We are always looking for extensive details and her website had tons of info on the breed, her dogs, and the process for adoption. We realized that Sherri seemed amongst the best Boston Terrier breeders out there, and decided to send our application. Since our application in November until our sweet Alonzo finally arrived home mid-July 2017 she has demonstrated to be a reputable, serious and loving breeder. She is always prepared, very knowledgeable, and always replies to our correspondences in a timely manner. She is always on top of her game, and you can tell by her website and her Facebook page. Even after Alonzo settled in our home Sherri has been following him on his social network page. I have never gotten a puppy from a breeder, but we can definitely say that she is what every breeder should look up to. I have also highly recommended her to friends who are interested in this breed. Alonzo is the sweetest little boy. He just really loves to cuddle with us. Boston’s just have the funniest faces. He is kind, loving, curious and well mannered. It has been easy to train him. We started leaving him outside of his crate when we leave to run errands and he has been very calm and never chewed on anything outside of his toys. Everyone who meets him when we take him out melts over his cuteness. He loves people (he always has to say hi to everyone!). I also notice he always cries when he sees kids because he wants to say hi to them, hence as I also read, they are definitely perfect family dogs. Again Sherri, thanks so much for bringing this little furry joy in our lives!!!" Hello Sherri, We did 12 weeks of puppy training with Burley (Emmy x Buzz) and he did terrific- has his AKC Star Puppy medal. He has brought so much fun, laughter, and joy to our family. Leah and Evan are great with him and Leah taught him a few tricks all on her own. He just got neutered last week and everything went well. The vet has a Boston too that he rescued and she has so many problems. Kind of like our old Boston, Eli. Our vet is so impressed with Burley and how great his health is and how well he behaves in the office. A true testament to his great parents and breeder! Burley is keeping us very busy. He loves to be outside. He is amazed by the fall leaves blowing around and loves to lay on our deck. We are so thankful to you and for him. You are a wonderful person and breeder and he is a wonderful puppy! Thanks again! We will keep in touch. I wanted to let you know what Scout"s been up to these last few months. After three training programs at PetSmart, she was tested to become a Canine Good Citizen. The AKC does the testing. There are 10 things they have to be able to do and she passed. She got a blue ribbon and a certificate from the AKC. A couple days later I contacted the volunteer coordinator at the local senior community about Scout doing visits. We had an interview and she passed with flying colors. She walked onto an elevator like it was no big deal and she’d never been on one. She’s fearless this one is. So for the last 4 months we go visiting on Sunday’s. We have our “regular” residents that we see weekly. She’s become quite the hit with the seniors as well as their families and the Homes employees. We went on Christmas Eve and the pastor invited us to mass! One woman who was in rehab from brain cancer surgery asked me to make sure I visit her when we’re there. She said to me “I love dogs”. She would ask me to put Scout on her bed so she could pet her. On our last visit she told me again how much she liked that we visit. Sadly she passed away the following Sunday. There is a married couple we visit. She loves Scout. She calls her “my Scout”. She grew up with Bostons. Another resident has such a soft touch that Scout starts closing her eyes and yawning. She gave Scout a stuffed toy for Christmas. We visit a 98 yr old who loves petting Scout. She’s a hit! She is very social and loves all the attention she gets. People marvel at how good she is and when I tell them her age they can’t believe it. She’s only going to get better with each visit. I highly recommend anyone with a Boston do this as they are social butterflies. We adopted our Boston Terrier (Anna) from Brett's Painted three months ago and couldn't be happier. Anna is beautiful with a playful, loving personality. She is perfect with our two young children, easy to train, and a delightful addition to our family. We're very happy we adopted from Sherri. You want a breeder that cares about your dog as much as you do, is knowledgeable, experienced, and available when you have questions or concerns. Because this was our first dog and have young children, we were very careful in selecting our breed and looked at a lot of different breeders. We definitely made the right choice. I couldn't be happier! 10 days ago I picked up my FurBoy Willie. I was greeted by the most wonderful lady Sherri holding an adorable little bundle, my FurBoy Willie. It was one of the most heart warming moments of my life. From the first contact with Sherri things were an adventure I would highly recommend to anyone who is looking to adopt a Boston. I felt as if I already knew Willie before he was born. Sherri sent updates, pictures, videos and was more then happy to answer questions. Willie is perfect, he is healthy, chubby, he even has a toy he still carries around the house. Because of all the attention he received before I brought him home, he adjusted well. I couldn't be happier, I not only have an addition to my family I also gained a friend in Sherri and a dependable person I can turn to if I need any questions answered regarding my FurBoy!! I highly recommend this breeder, she has the most beautiful Bostons....my FurBoy is amazing!!! Ivan, my 10 year old Boston agrees!! When we decided that a Boston Terrier was the best breed for our family, I decided to do some research on which breeder to use. As I was doing my research, I came along Sherri's website . I was impressed with all of the information she had to offer, how thorough her website was and her ethics when it came to breeding. I knew she was the breeder for me, but we live in Texas, so I was hoping to find someone closer. I emailed her to find out if she knew of anyone in my area and she responded to let me know that she didn't. I started to look at some sites on the internet for breeders nearer to me and I wasn't impressed with their websites. Something just kept bringing me back to Sherri. After corresponding more with her, I decided that no matter how far away she lived, she was the one we wanted to adopt our fur baby from. I flew to Indiana on Friday to get my little guy and fell even more in love with him than I already was. Sherri is the best of the best! Our entire experience with Sherri has been a true blessing for our family! Never did I think, I would find a breeder who put their heart into their pups the way Sherri does. The love, care, and dedication she puts into her fur-babies is apparent in every aspect. I cannot express how much I appreciate the rural family-centered environment Sherrie provides for her pups. Traveling to pick up our puppy was not an option for us; instead, Sherri graciously made the long trip to us. After a lot of driving and 2 flights, Sherri arrived at our local airport with puppy in hand! It?s been a little over a week since that day and we continue to be marveled every time we look at our sweet girl. Simply put, without Sherri our family would not be complete. For this, we will be forever grateful to Sherri and Painted-S Bostons! Being first time pet owners with Max, or as my four year old son says, " Max Comet Negrete" Comet being his birth name given by Sherri. We couldn't be more satisfied with not only our pup but the great experience Sherri allowed us to have. Searching for a trusted and honest breeder doesn't come easy. Sherri was not only reassuring but extremely informative and was ALWAYS available with quick email and text messages. She even took the time to send pictures and video, that meant everything. I have to confess I was a bit skeptical proceeding with the deposit, but I did my homework and found Sherri on Facebook (a bit ashamed about that :) but she was real. Not a SCAM! Max is going to be 5 months come May 1st and we just love that little guy!! He's beautiful. We can't thank you enough. You put a lot of hard work into what you do and it shows. You made a GREAT choice by allowing Max into our home. We are forever grateful. Sherri you rock! Adopting our Samson from Sherri has been an incredible experience. Sherri is professional, friendly, responsive, organized, and most importantly loves her fur family. She is a breeder with the highest regard and respect for her dogs and for the breed. I fully expect to adopt another fur baby from Sherri in the future and would highly recommend her. Thank you Sherri!! Working with Sheri was amazing! Her passion and dedication for Boston Terrier's shows the moment you contact her. We received our sweet boy, Rex, about a month ago. We were worried about getting a puppy, but Sheri answered every question we had quickly. Rex has become an amazing member of our family. We were that couple that got newborn pictures made- with our puppy! He is beyond perfect and I couldn't imagine life without him! Rex was not a perfect addition to our family- he made us a family. Thank you Sheri so much for helping us find our first baby! And yes, he has already got his tux for the wedding. We had an amazing experience working with Sherri. She took the time to answer all our questions and really got to know our puppy. Our Boston Muggsy is a great dog, she brings a lot of joy to our home and has a great personality. Muggsy gets along great with other dogs, all people and she loves kids. Thank you Sherri! Spike is doing great at 7 years old. He is not just part of the family, he pretty much runs things around here. And we thank you for Spike! Sherri was extremely helpful and a pleasure to work with thru the puppy purchasing process. She was readily available and gave great feedback with timely responses each time. I would highly recommend Sherri as a breeder as she is very on top of her game and puts her own personal touch on each puppy she sells! Izzy came home and you could tell she was very well socialized and friendly from day one. I have no doubt that it was influenced greatly by how Sherri raises her puppies with such love and hard work. I reached out to Sherri after I lost my Boston Terrier...he fell into our lives expectantly and the whole family fell in love with Bostons. I did a lot of research looking for reputable breeders, and Sherri's name kept coming up over and over again. Sherri could not have been more kind, more helpful, or more responsive. She puts her heart and soul into these puppies. The whole puppy adoption process was so smooth; she was so organized.... she really made it easy for us. Zeke, our puppy, is absolutely amazing in every way. We absolutely adore him. What a great experience!!! Thank you Sherri! I am forever grateful to you!! In January of 2016, we decided to get a puppy. I looked for breeders and once I found and contacted Sherri and she responded right back, I knew we had found the one. Even though our pup Arthur wasn't born until Memorial Day, Sherri kept us in the family by updating us on other litters, updates and our place in line, which made our wait so much better. When we got Arthur in August, the vet commented on how well the medical records were kept and how handsome Arthur was. Ever since, he's been the best, happiest, sweetest, silliest puppy! He has slept through the night since we got him (only barking in the a.m. to tell us he's hungry!) and is so well-socialized and behaved. We love him so much and I don't think we could have had as great experience anywhere else. I recommend Sherri with all my heart. Thank you for everything!! From the moment we reached out to Sheri, she was responsive, friendly, and helpful. Each week we would get pictures of our baby boy, and the communication was open throughout the adoption process and afterwards. Our puppy has been such a wonderful experience, we are very proud parents and enjoy our Boston, "Dexter", so much! His size and temperament is great, and we get compliments on him everywhere we go. He's one handsome puppy! Thank you, Sheri! Dexter is a gift! After deciding on what breed I wanted, I laboriously searched dozens of breeders/ websites, until arriving on Sherri's. After communicating a few times with Sherri, I knew I wanted to adopt from her. Why? 1) She was in a commutable distance 2) She had an updated website 3) She seemed organized and was very responsive to my communication 4) She seemed absolutely passionate about breeding 5) She openly offered her knowledge to me and was very thorough with any questions I had 6) Her puppies seemed well cared for, loved, socialized, and medically checked Now having gone through the adoption, I can say without any hesitation or doubt, that I am extremely happy Sherri allowed me to adopt a wonderful, happy, and healthy puppy, Aria. Even after the adoption, Sherri continues to ask about Aria and is very helpful and patient with any questions I have. If you have any concerns about where to adopt, I can tell you, you needn't have any with Sherri. If you're interested in this breed, you should look no further. Sherri in my opinion is the epitome of what an excellent breeder is! She has been fantastic to work with and we have enjoyed the whole experience. Her Boston's are the best looking that I've seen, and I have searched many breeders. I appreciate the complete dedication she gives these animals and her customers. Not to mention the health testing and other information available on her fantastic website. This is our third Boston Terrier. We named our new baby girl "Dottie" because of the cutest little black dot on the top of her head. She has been the best little pup! Our 11-year-old male Boston "Jack" is very happy to have a four- legged companion again. We couldn't be more pleased. Happy in Illinois. We were incredibly fortunate enough to welcome our newest family member, Minion, via Brett's Painted Bostons. Anyone interested in adopting a Boston simply HAS to go through Brett's. Sherri not only knows everything about these wonderful canine companions, but perhaps more importantly, she provides the love, care and attention they so desperately need from prior to their birth to the heartwarming meeting with their humans, she takes the time not only for the precious puppies, but for the adoptive family as well. She communicates all aspects a prospective family will need to know prior to adoption. If a Boston is a right fit for you and your family, you absolutely cannot go wrong with Sherri of Brett's Painted Bostons. Thanks to Sherri, our family became one 4-legged member larger and happier all the way around! Thank you Sherri! Brett's: A Friend to All Bostons! There are so many great testimonials to Brett’s Painted Bostons that there isn't much left to say. We brought home this wonderful, tiny, tiny (did I mention tiny?) package of pure joy and emotion at 8 wks. of age. She is now 4 months and we have not regretted a single moment. This feisty little she devil is so very much loved in our family. We have to be careful not to over-spoil her. She is smart and energetic, yet she cuddles with us at a moment’s notice. Sherri raises such gems and I am so very glad we found her when searching for a Boston Terrier to add to our family. Of course, I knew she would be everything we wished for in a breeder. Her web site is testimonial to that. She is always available on phone and email and very knowledgeable. On top of all that, she really cares and is a wonderful person to deal with. I think she will be a friend forever. Remember, Sherri, if you are ever our way, please come visit. I'm sure Kinsey will love to see you! Almost anyone can breed purebred AKC dogs. But that does not mean your new puppy was bred ethically. Sherri Brett is an ethical breeder and more. It is rare to find a woman like Sherri whose breeding program involves all the health testing to uphold the highest quality puppies that produce AKC standard Boston Terriers. Sherri is an amazing woman of faith. Working with her for six months prior to picking our puppy was a wonderful experience. We couldn't be happier. Little Oskar loves his new big sister, Lily, a Vizsla. At 10 weeks, he is so well adjusted, smart and active - blessed, thanks to all the love and care Sherri provided him and planned long before. Thank you, Sherri, for being the kind of breeder who always makes time to answer all my questions and concerns. I was so happy when you welcomed me to the Painted family! After my 11-year-old Boston had to be put to sleep I realized that I needed a new Boston Buddy and began my search. Sherri was the ONLY ONE to respond to me more than twice. And her quick and responsive replies never quit. I came to find what a superior breeding program Sherri has and how each of her litters were so carefully planned. Besides her multiple wins and champions in the ring, her puppies offered were and are top of the line. Sherri's meticulous health screenings assured me that I wasn't going to find a healthier Boston anywhere else. And with all the love a breeder can have for her puppies, she personally flew my little boy all the way to me in Ft. Lauderdale! She's wonderful and the pup she provided me with is wonderful. I am so thankful to Sherri. What a wonderful experience we had with Sherri Brett! We brought home two bundles of pure Joy-Sunrise and Cupcake, two little baby girls who are a bundle of energy. They were born two days apart and they are so much fun to watch play and interact with each other. They play together and sleep next to each other. They are a delight to have in our home. Sherri is so helpful with any questions or concerns you have regarding their care. She goes above and beyond emailing, sending pictures and videos of the puppies and welcomes updates on the puppies once you take them home. Our vet posted pictures on his Facebook of our baby girls and commented they were fine puppies. We got a multitude of likes!!! I am not sure how Sherri handles all the responsibilities she has, but she does a fantastic job raising quality Bostons. We are happy with her standard of care and the process you complete to be chosen to take one of her baby’s home. God Bless Sherri for all she does and her efforts. My husband and I have had multiple Boston Terriers and knew we were ready for another. We researched breeders all over the country and came across Sherri's website. It was immediately apparent that she was in a class of her own among BT breeders. I had many interactions with Sherri over the months of waiting for my Boston baby to be born and then received frequent updates from her until our puppy was ready to go home at 8 weeks of age. Communicating with Sherri over the phone or email was very easy as she is extremely responsive. For Sherri, breeding Bostons is not just a hobby, it is a huge focus and priority in her life! She truly does love our babies as much as we do and there is nothing that she wouldn't do for any of them. Piper might have been the first Boston Terrier that we have received from Sherri but she certainly won't be the last!! Thank you, Sherri!! Thanks so much for letting us into your home to view your Bostons. They were certainly comforting to us after our loss of our own Boston-----"Bean", over this past weekend. Time is what we need now, and we are so grateful to have something positive to focus on with the upcoming litter of "Fancy" and "Bullet" and the introduction of a new Boston to our family. I wanted to thank you Sherri for all that you did for me when buying my Boston. You went above and beyond and was really helpful with keeping me up to date with him with the weekly pictures and e-mails about his health. He arrived when promised and he is more than I expected. Thank You so much Sherri for Vedder! Hey Mom! I love the webpage! I just love your dogs and as you know your grandsons do too!! :-) You've done a great job with the pictures and information. Good Luck! Love ya! Hi Sherri, just wanted to let you know that Rico is doing great. He is such a big boy; we have our check up with the vet next week but I'm guessing he is close to 16 lbs. Rico has such a wonderful personality! Rico and Koby are inseparable. Sherri, we just can't thank you enough for Palmer aka "Slugger" and for making his adoption process so enjoyable and stress free. Palmer is beautiful, energetic, intelligent, loving, and very well behaved. Hope you are enjoying the pix we post on FB. Our little boy is growing up quick!